Why is there so much war in the world? Is it because of religion? Money? Media? War is such an ugly thing. War is just one large battle of a whole bunch of egos. I understand so many points of view when it comes to war but I just can’t wrap my brain around its origination or why anyone thinks that it solves anything. I have never heard a more true statement than: An Eye for an Eye Makes the Whole World Blind. I guess I am just confused as to why masses of people have grown to believe that war is going to solve the world’s problems. I can say with strong conviction that this will never be the case. Call me naïve if you will but war is without a doubt not the answer. I admire the men and women that risk their lives fighting for our countries freedoms and not for one second do I take what they do for granted….I see it as something way more brave than anything I would be able to do. The people that serve are the most honorable people in the world because they take such pride in their country. These people shouldn’t have to do this though…war should not be an option….but since as long as we can all remember…war has become the norm in life. So what is the cause of all of these wars that are going on in far too many parts of the world? Of course religion plays a part in the division of people and the cause of them retaliating against each other. Religion is this beautiful concept and idea that (I believe) should bring us together but unfortunately it drives us further and further apart. How beautiful is it to live in a world with such a variety of beliefs in creation and a higher power. Instead of embracing each other’s beliefs, we point fingers and tell people that they are wrong. We retaliate and tell people that God is this or God is that. Why can’t we allow people to have their beliefs and just listen to them….take in what they have to say. People do not necessarily want you to believe in what they do….they just want to be heard. What is causing war is the human ego. We have become all self-absorbed and believe that our way is right that we stopped even listening to what others have to say. If only we took the time to listen and allowed people to express their feelings…we might just see a little bit more peace in the world. 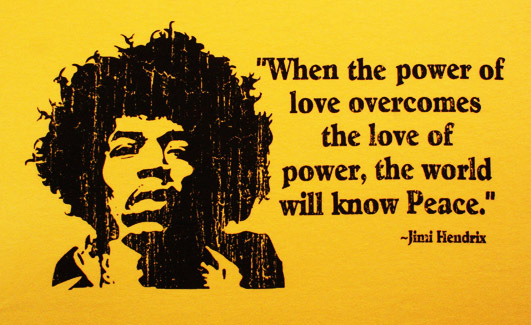 Call me a dreamer if you must but Jimi Hendrix spoke such truth when he said: “When the power of love overcomes the love of power, the world will know peace.” It should be that simple but because of our societal training it is not….it is something that must be worked on day in and day out. It is unfortunately more difficult for some to let go of their power. We, as a society (myself included), are so quick to judge and so quick to assume….we don’t ask the necessary questions. By simply asking why someone thinks or feels the way that they do…we could open up many doors for understanding why people act and think as they do. Everyone in the world has their own story and has gone through their own journey in life and it is so easy to negate people from our lives because we don’t relate to them….that does not mean that they don’t experience the same human emotions that we do. I truly believe that everyone has a soft, compassionate side but for some this side is masked and hidden behind what they have been taught throughout life….some people are unable to break through the hard shell because they believe if they do that they will be considered weak. Now can you see how the ego is leading us into mass chaos??? We are allowing others to control out actions and our thoughts and we are allowing the negative to outweigh the positive. There are so many factors that play into the human ego….money, power, media, etc. These are all of the tools that drive people to forget about doing for humanity and instead doing for oneself all of the time. I have always said that life is this great balancing act and most people are off-balance. That is not an insult (because I fall into that category too). It takes realizing that you are off balance to make the necessary changes and to be able to see life outside of just yourself. So much beauty comes from simply learning about others. People have told me that I sometimes ask too many questions or I am too nosey….I will allow them to think that. I ask the questions because I want a better understanding of others….to see them for their worth and what they are offering to the world….not see them from a preconceived judgment. I am not saying that all that I speak of is easy….trust me, through personal experience I know it is not. There is work involved. Even the Dalai Lama must work to maintain balance and inner peace in his life….that is why he meditates and prays every day. He knows it is these things that help him achieve the inner peace. That is the same reason I meditate. If I skip meditating for just one day, I feel a great difference in my mood. I find it so much easier to become annoyed and irritated at the little things. When I meditate I allow the stress of the world to slowly drift away and I am constantly shocked how easy it is to let things go….to not allow the ego to control me….or the outside circumstances to play me like a puppet. War is such an ugly thing and there are so many people in the world that find it to be a necessity because of how our society has evolved. Maybe they are right….maybe the hole has been dug so deep that there is no longer any chance for repair so why not just fight to the death. I have a really hard time believing that to be the truth though. I write in hopes that people will read my words and allow themselves to look within but also look outside of themselves. It is never easy to admit our faults or see ourselves as anything negative (trust me…again I know from personal experience). This has been a year that I have finally looked at myself for who I was and realized the damage I was not only doing to myself but the damage I was doing to others. I realized that if I didn’t make a change I was just going to be a statistic that was a part of the problem….I could not bear the thought of that. I could not continue to live in this world of denial. I knew how I had been acting and I needed to take ownership for my wrongdoings and my behaviors and I needed to change them. Easy? Absolutely Not! Necessary? More than one can even imagine! With the changes came the ability to see and feel myself and the world through such different eyes. There are many factors that play a part when it comes to war but the main cause of war is undoubtedly the human ego. People can tell me I am wrong until they are blue in the face but when you take the time to think about what damage the human ego can do…I believe that you will see that it is the ultimate source for destruction. It is the thing that crushes us as human beings and controls our thoughts and actions day in and day out. Watch Zeitgeist Addendum & you will have your answers, if possible start with Zeitgeist and then go through all the parts. You will find most of the answers of how you live an en closely liberated fictitious LIFE! The whole series is available at no cost on net, just Google it. Keep it flowing Diane…….you are being guided in the right direction not for just your own self but also for others through your writings…..only the enlightened ones can write…..the rest just read and copy, paste other people’s writings to appear enlightened. Cannot possibly express it any better than did Jimi Hendrix–and cannot agree too much or too often! Thank you for this important message today! I’m a recent graduate of Union Theological Seminary in New York City and in world religions classes we often discussed the core tenets of faiths. Until adherents of various world religions get this core of their faiths – beliefs in the practice of love and compassion – the wars will continue. But as long as I’m breathing, I have hope, especially if voices like yours are continued to be heard. Wish the dreamers filled in the world! G’day Diane… Every now and then I catch your brain-box emptying itself into my feeder over here in ‘Oz’ (alas – technology! 🙂 ) and I enjoy ‘wandering around’ in the things you have to say! War. it’s such a short and ugly word isn’t it? It’s wrapped up in so many ugly things.The ultimate irony of course is that our humanity often comes to the fore in war… people are stripped back to the absolute basics of survival and terror and they discover the truth about themselves and their mates – simply because war squeezes just about all of the ‘bulldust’ out of you – leaving you with an incredible awareness of what’s truly real. Life is a precious, precious thing and it’s a horrifying act to have to take it – especially in war. War to me is all about differences. We worry ourselves sick about it (our countries do, our ‘leaders’ – religious, social, political or otherwise – do too. Heck – even as parents, kids and everyday wage earners – we still do). We watch as this difference builds up toward resentment or jealousy and we watch thing ‘crumble’ from there. Imagine if we celebrated our similarities… can you picture it? We all love our sons and daughters – so why would we want them to put at risk during a war? We all need a healthy planet to survive on – so why would we want to damage it further? We all want happiness and caring – so why should we invest in hate and destruction? We see a world today that has learned some of the worst lessons about differences and very few of the best lessons about similarities. We live in a society today that doesn’t want to learn from it’s mistakes. Well – at least those around us who consider themselves our political, social, religious and world leaders – don’t seem to want to! If they did – we’d be speaking to our children and asking them what THEY want for their world – rather than tell them what their going to have and that they should be happy with it! Our units of measure in this world are all out of skew… we need to tell our children and their children that this world is for them now – it’s not for us – and it’s them we need to invest in, as our time has past. We can do that at least…can’t we? I like to think (and believe) that we can do something about the very real possibility of our children repeating OUR past – I like to think that they’re a darn sight smarter than we are and that they’ll do ok by this world and wish to invest in the similarities they discover with each other – rather than take up OUR differences. Here’s hoping Diane! I used to wear a military uniform see – did so for many years – and I sure as blue blazes have no want to see my children, doing the very same thing, for all the wrong reasons! Because of greed and power-hungry men and women at the top! If our leaders really cared about humanity, there wouldn’t be any wars.